The combination of headlands and bays has shaped much of the world’s coastlines, and is a product of a process called differential erosion. Although the entire coats is attacked by waves, tidal currents and winds, not everything is eroded at the same rate. Harder and more resistant parts are eroded more slowly than softer and less resistant sections. Where there are alternating layers of hard and soft rocks (hard, soft, hard, soft and so on) headlands and bays may form. The areas of softer, more easily eroded, rocks will be eroded more quickly. The bands of harder, and more resistant, rocks are eroded at a slower rate. Because the softer rock is eroded more quickly than the harder rocks, the sea advances inland in this area, creating a bay. Meanwhile the harder rocks on either side, that used to be level with the softer rocks ,are eroded more slowly and are left behind, sticking out to sea. They become headlands. The headlands then protect the bays from further erosion by absorbing most of the wave energy hitting the coast and thus reducing wave energy within the bays. This allows sediment to be deposited, leading to the creation of beaches. Although the alternating bands of rock are usually at 90 degrees to the coastline (pointing out to sea) this is not always the case. 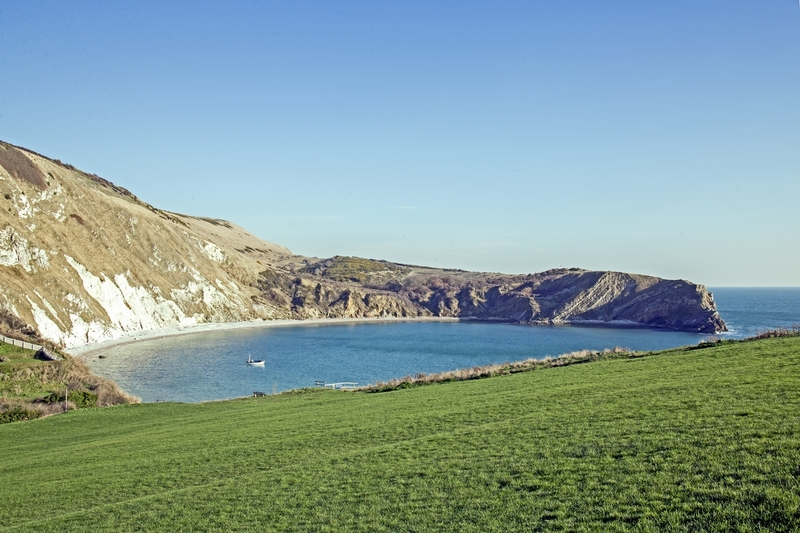 In some places, such as Lulworth Cove, in the UK, a resistant band of rock lies parallel to the coast and protects softer rocks behind it. When the hard layer is breached, the sea can get behind it and erode the softer rocks to produce a small bay or cove. In calm conditions the narrow entrance to the bay,and the band of resistant rock, greatly reduce the power of the waves, allowing deposition to occur in the bay. The photograph shows Lulworth Cove, with the resistant band of rock on the right, and the bay created to the landward side.